(NEW ALBANY, Ind. )—About 40 years ago, a novice nurse at a hospital in Louisville placed a phone call to inform a man that his wife, a patient in the nurse’s care, had just died. The conversation was bound to be difficult—it’s one of the most challenging and delicate actions a healthcare provider will be asked to take—but on this occasion, it somehow lurched from difficult to uncomfortable to traumatic to disastrous. Just half an hour before, the two had been chatting amiably at the patient’s bedside. The nurse had pledged to contact the man if there should be any new developments. It was very straightforward. Yet in the moment that mattered most to both of them, they were unable to connect with one another in a caring way. For the nurse, who had thought she was at the top of her game, it was instantly clear that while she had mastered the technical side of her job, she had failed at something equally important. “I have to get better at this,” she told herself, when she had time to reflect. And so she did. Today that nurse, Janice McMahan, is associate clinical professor of nursing at IU Southeast. In courses ranging from nursing management and nursing ethics to clinical simulations, she employs innovative teaching techniques to give students the ability to be not only technically sound nurses but also empathetic human beings, and to connect the two qualities synergistically to deliver a healthcare experience that is healing to patients and families and enlightening to nurses. Janice McMahan has been a nurse for over 40 years. After her initial years in practice after gaining that first diploma, she moved into management, and even worked her way up to lead a hospital. But despite her successful ascent, she found it difficult to be so far from what really inspired her as a person. She found renewal professionally and personally by furthering her academic career and moving into teaching while continuing to practice nursing hands-on. McMahan is specialized in the area of critical care. Besides her teaching duties at IU Southeast, she works as a critical care nurse in the Surgical Intensive Care Unit at the University of Louisville Hospital, a Level I trauma center, caring for patients with complex trauma-related issues. In this world, the hospital is a battlefield in which suffering is acute and patient needs are immediate, extreme, unpredictable and constant. The work requires McMahan to stay up to speed on advances in cardiac pacing, intracranial pressure monitoring, renal replacement therapy, continuous ventilation and other modalities. It also requires her to see through the wires and tubes to the human being. In her decades as a critical care nurse, McMahan has seen it all. Unconditional acceptance is the ethical bedrock of what nurses do. It reduces the situation to the bare essentials: patient and caregiver, two human beings working together to support life. 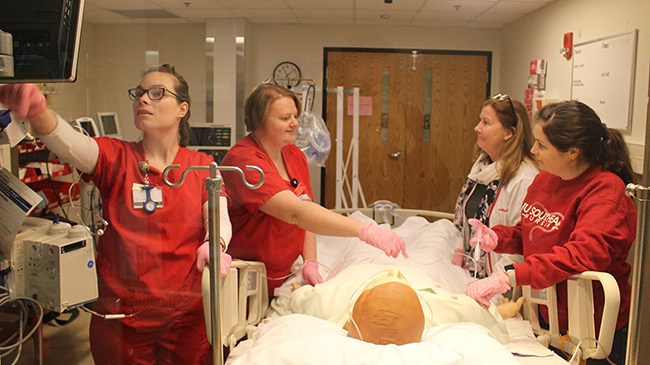 In the Judge Carlton and Sue Sanders Laboratory for Nursing Education, nursing students (from left, in red) Jennifer Branstein, Tabitha Lori and Melissa Vance build team dynamics while treating a simulated patient, as Janice McMahan acts as advance practice nurse. In addition to dealing with extreme situations in a pressure-cooker environment, today’s nurses also need to master an ever expanding corpus of knowledge and keep pace with advances in medical technology. To that end, McMahan has developed Advanced Cardiac Life Support (ACLS) training and mock testing, utilizing the nursing lab to practice advanced skills such as cardiac dysrhrythmia interpretation and interventions for life threatening situations such as defibrillation. 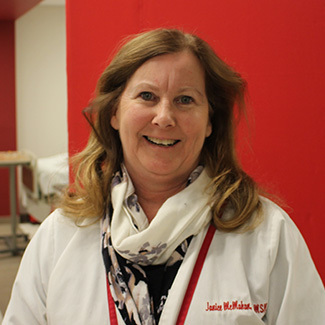 In her pre-licensure nursing courses, she partners with Dr. Laura McIlvoy in the design and administration of tests that prepare students to pass the National Council Licensing Examination for Registered Nurses (NCLEX-RN). The format matches the NCLEX-RN’s mix of computerized multiple-choice, matching, ordering and other questions. But McMahan goes further in using Remark, a computer program that allows her to pull statistics and point biserials for each test question. This information helps her weed out or rework ineffective questions. At the same time, the other fundamental part of their mission–to cultivate a caring approach to patients and their families—has not changed. “Nurses don’t treat conditions, we care for patients,” McMahan said. Central to McMahan’s approach is the emphasis on engaging the “whole patient”—i.e. the physical person complete with assessments and labs and the story of what has happened and is going to happen to him or her, but also including the person’s family members, value system and cultural mentality. Students come to see healthcare itself as a culture, with its own language, and to translate that language into terms that nonprofessionals can understand and take comfort in. In mastering the ability to contextualize almost instantaneously, students develop a unique human touch, and the ability to communicate medical facts to nonmedical people. They become a sort of living synapse between the patient, the family, the doctor, the hospital, and the treatment plan. McMahan often begins class with a question. Students who have taken her classes before know that this is not a roll call or a mere rhetorical flourish, it’s a mantra, something of a daily devotion, a call to the students to center their attention—and indeed consciousness—on the task at hand, which in critical care means a life-or-death medical emergency. Being present means being fully focused in the moment. To be able to access the full array of nursing skills while opening an emotional channel to the needs of the patient and family on that level. It means attending, in the broadest sense, to everything that is going on. McMahan is quick to credit nursing theorist Jean Watson for opening her mind to this approach, known as caring theory. As McMahan explains it, caring theory states that nurses center their consciousness and intentionality on caring, healing and wholeness, rather than on disease, illness and pathology. McMahan integrates caring theory into her curriculum via case studies, group work, audio visual clips and interactive internet sites, among other methods. The case studies in particular are an incredibly effective tool. Clinical placements in Intensive Care Units (ICU) at the Louisville Veterans Administration Hospital, University of Louisville Hospital, Baptist Floyd Memorial, Clark Memorial and other settings give students the opportunity for real-life experiences and the grist for in-class closed-door discussions of medical challenges, personal issues, family interactions, staffing concerns and a host of other topics. The students not only gain confidence from their own ability to process and express their experiences, but begin to learn how to leverage the experiences of their colleagues to address deficits in their own work. To deepen their understanding of individual cases, clinical students are also tasked with writing a process paper on one of the patients they have cared for, incorporating not only their technical knowledge but also Watson’s theory of caring. “Even though this is a course concerned with very advanced technology, it is important that the caring part of nursing not be forgotten,” McMahan said. Much of McMahan’s work at IU Southeast now revolves around clinical simulation in the Sanders Nursing Education Laboratory. Here she acts as preceptor or advanced practice nurse who helps the students during scenarios by answering questions and assisting with hands-on technical skills. “I help them problem-solve what is going on with the patient, what the possible causes might be, and which nursing actions are most appropriate,” McMahan said. The lab is not a doll house. It has the look and feel of a real hospital ward. It is stocked with real medical tech. And because it is taken seriously by faculty and students, it is a thoroughly convincing environment. Again, like the tests, the value of the simulation as a teaching tool is only as good as the assessment of outcomes. McMahan has co-designed an evaluation tool that based on the Quality and Safety Education Initiative for Nurses (QSEN) model, the industry standard for nurse preparation. Evidence-based performance objectives were developed for every simulation scenario based on QSEN competencies of patient-centered care, teamwork and collaboration, evidence-based practice, quality improvement, safety and informatics. The goal: prepare nursing students not just to graduate and get a job, but to continually exhibit the knowledge, skills and attitudes to improve the quality and safety of the environments in which they will be working. Commitment, compassion and community are the pillars of McMahan’s approach, which she emphasizes not only to students but also to less experienced faculty. Here, too, are echoes of the past. McMahan was herself transformed through the mentorship of Lillian Yeager, dean of the School of Nursing from 2002-2006. Now she fulfills the same role of thought-leader for junior instructors. At the very core is the ability to be conscious of what nursing really means, to oneself and those touched by it. Success in nursing is the ability to bridge divides of culture, education, class, income, gender, and everything else, in order to communicate compassion. Recently, the widow of a patient in McMahan’s care who had died two years ago came to the critical care unit to distribute a batch of homemade cookies to the staff. When she saw McMahan, her face lit up with pleasant recognition.